This is a perspective from one driver to provide an example for how the Rav4 EV has been used for daily life, and in particular how DC charging allows you to use an EV for trips that take you beyond the range of your battery pack. For those not familiar with the 2012-14 Rav4 EV, Toyota made around 2,500 and sold them only in California as a compliance car. The EPA rated range was 113 miles. DC Charging: up to 400V and up to 125 amps, for non-Tesla EVs; up to 80 miles in 30 minutes. JdeMO is a DC charging port made for the Rav4 EV. I’ve had my 2012 Rav4 EV for 58 months now. The first 29 months I charged the car exclusively with the L2 charge port. For the second 29 months I charged the Rav using the L2 and JdeMO ports after Tony Williams of Quick Charge Power installed his JdeMO DC charging port on my Rav. So I thought this would be a good time to compare how I drove and charged the car before and after adding the DC charging port. 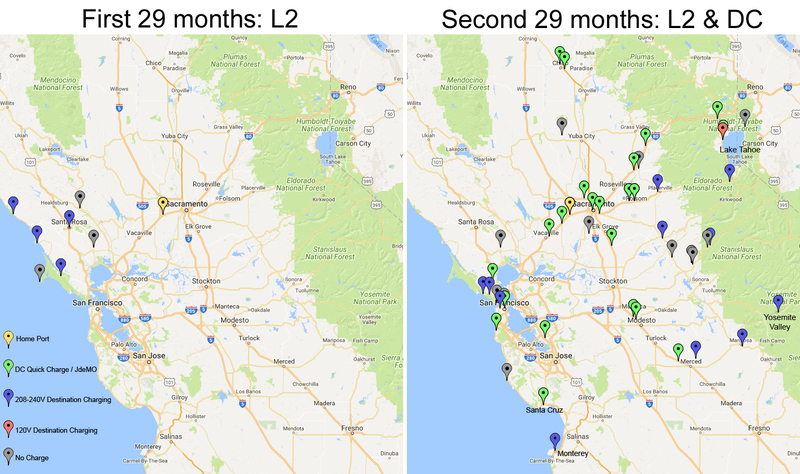 This direct comparison shows how one person drove their EV when L2 charging was the only option, and how the same car was used when DC charging became an option. I’ve kept basic monthly stats like miles driven and kWh of electricity used from the battery pack each month. The number of kWh used from the pack was derived from miles driven and the Entune monthly miles per kWh estimate (and compared to data logger values). I have the myEV data logger and that’s given me data on how many kWh I got from DC charging sessions. I verified data logger numbers by comparing with data provided by the DC charger itself or recorded on the EVgo website, and these numbers are usually within 1 or 2 percent. Putting these data together I can compare some basic numbers from the first 29 months with those from the last 29 months. TO BE CLEAR: this is one data point, from one driver, in my part of California. However, my driving habits match that of the ‘average’ driver in the U.S. in terms of miles driven per day / month / year. But remember, YMMV. In 58 months I drove 70,150 miles. For the first 2½ years I used the Rav for commuting back and forth to work, weekend shopping trips, errands… standard stuff. The Rav is my first EV and it was a revelation. I love the car for all the reasons that many have written about, and I had that EV grin for a year or two. During that time I often charged at work, and also charged at home in the garage, both very convenient since the car charges while it’s parked for hours. 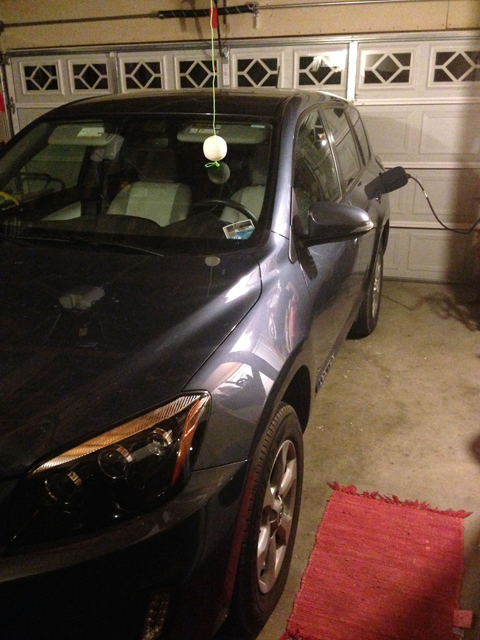 Charging your EV with an L2 EVSE at home or while you work is convenient since the car charges while parked for hours. 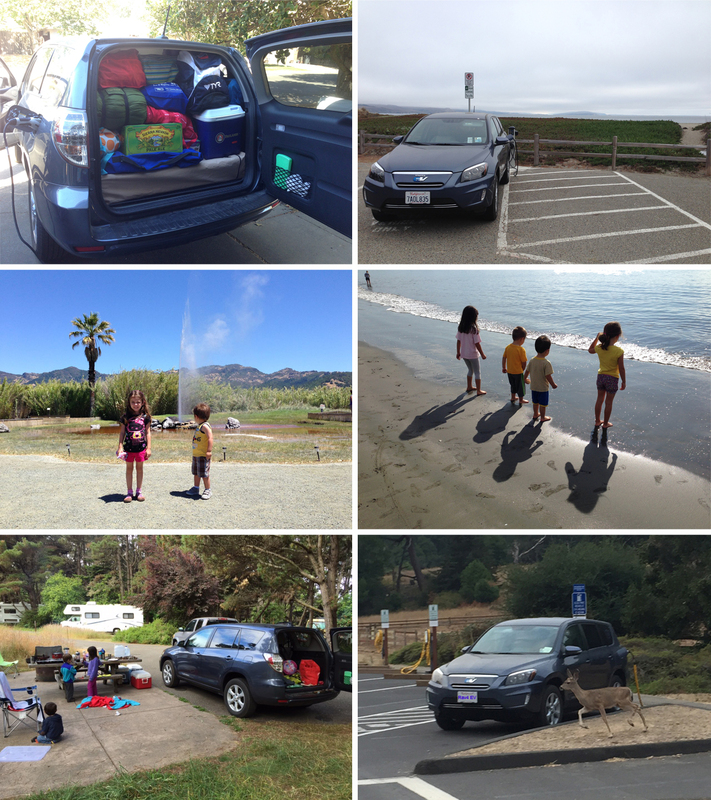 We also used our Rav4 EV for local excursions and a few weekend camping trips. The camping trips depended on L2 destination chargers being available and in working order… so we chose campgrounds that were within the range of a single charge and were near a destination charger. I had the whole weekend to get a charge so it seemed like an acceptable risk and in the end everything worked as planned. Point Reyes: 90 miles one way. 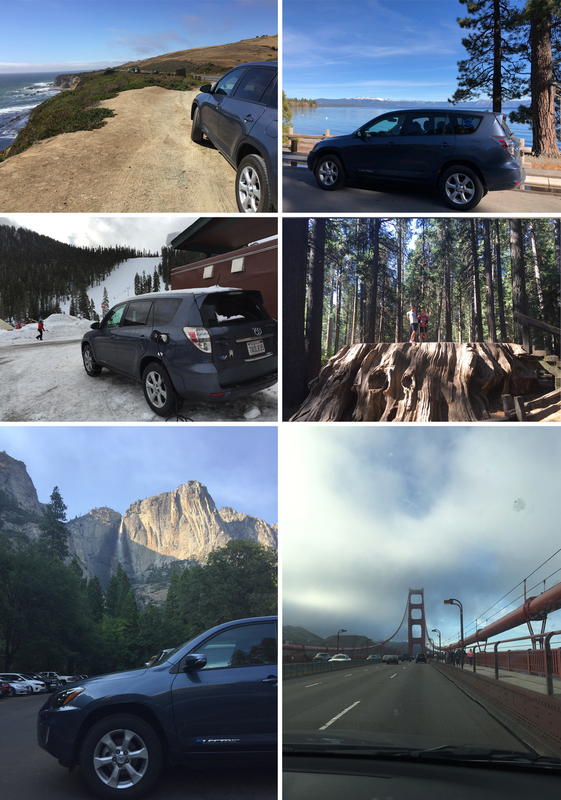 Camping trips to Bodega Bay, Stillwater Cove, and Point Reyes, and a trip to see California’s Old Faithful in the Rav4 EV. I cannot state strongly enough how well L2 charging works for day to day commuting and errands around town. Many of us charge our cars during the night while sleeping, or at work while in the office like me. But this can be an issue for day trips that take you beyond the range of a single charge, where there isn’t a destination charging station, or when you don’t have the time to plug in and wait. In short, charging in your garage is great, but you can’t take the garage with you on a road trip. One example, we go into the Bay Area several times a year for work or weekend day trips, and even though there were already quite a few public L2 charging stations at that time I never considered making that trip in the Rav4 EV because I’d need about 5 hours of charging to make it back home and it seemed more likely than not that the L2 stations would be in use. I didn’t want to end up waiting around for hours, with kids, waiting for a station to become available. And that’s just for a 90 mile trip. So my solution was installing a DC charging port to extend the range of my EV. At the end of Septemeber 2015 Tony Williams of Quick Charge Power installed JdeMO on my Rav4 EV, and it was like I had a new car all over again. For the next 2½ years I used the Rav for the same commuting and family errands, but with the JdeMO charging port on board we used the Rav more. I drove an extra 4500 miles in the 29 months after JdeMO was installed, which averages out to about one extra trip of 150 miles each month. Simply put, and as the map below shows, we went to more places with the Rav after DC charging became an option. NOTE: None of these trips are exceptional in any way. People make these sorts of regional trips in their cars every day, and that’s the point. Now we could make those trips in our Rav4 EV. Adding the DC charging port to our Rav allowed us to use domestic energy to power our trips, significantly reduced our emissions, allowed us to use the same family car more often, AND with the storage capacity in the Rav we always had enough room to store the gear we wanted to bring along for a family of four. DC Charging Covers 10% of my Driving. The Toyota Entune app, monthly mileage, and the data logger told me that in the second 29 months I used an estimated 10,100 kWh from the battery pack, and 1077 kWh of that came from DC charging sessions. So DC charging provides about 10% of the energy for my driving. Another way of putting it: 90% of the time I’m driving back and forth to work, and the other 10% of the time I’m having fun. The majority of my energy still comes from L2 charging at home or work, but with decent DC charging infrastructure in my part of California, we now use our Rav4 EV for longer trips. Great memories from trips to Monterey, Lake Tahoe, Calaveras Big Trees State Park, Yosemite and many, many visits to the Bay Area. How Often Do I Use DC Charging? 65 times over the 29 months, so about twice a month. How Long Do I Charge? My average charging session was just under 30 minutes (range 5 – 50 minutes). On longer trips I usually charged for about 45 minutes. How Many kWh Do I Get in an Average DC Charging Session? 16.5 kWh. It’s all about the amps: 125 amp DC charging stations can deliver over 22 kWh to the Rav4 EV in 30 minutes while newer 100 amp EVgo stations usually provide just over 17 kWh in 30 minutes (and of course other variables come into play like SOC and temp). How Well Does DC Charging Work? I haven’t had problems charging and haven’t had to wait for other drivers, yet. EVgo has the largest non-Tesla DC charging network in California so I’ve used them alot, but I’ve also used DC charging stations operated by Greenlots and Chargepoint. How Do I Like DC Charging Stops? I’ve used 25 charging stations and pretty much like them all with a couple exceptions. The DC charging station at the Davis Commons is in a very crowded parking lot and the chargers were often ICE’d; and the Linda Mar station in Pacifica didn’t have many food options…. on the other hand 30 minutes might give you enough time to walk to the beach and back. Those minor gripes aside, most chargers are conveniently located in shopping plazas along major highways where you have good options for coffee or a bite to eat, and 30 minutes goes by quicker than you might imagine. On one of my first trips using DC charging I plugged in and then started a timer. Walked to Starbucks, got a coffee and warm sandwich, took a quick #1 break and headed back to the car. That was 22 minutes. Yes this is longer than it takes to pump gas, but….. gas. For me the benefits far outweigh other considerations. Typical DC charging station, this one in San Rafael. Regeneration Can Provide 10% of the Energy Stored in the Pack. Quick aside here: some of the energy used from the pack comes from regenerative braking. The amount of regenerative energy will vary widely from driver to driver and trip to trip depending on traffic, driving conditions, etc. To estimate how much energy can come from regeneration, I actually counted the regen bars during a commute to work one day, and compared that to the total energy used from the pack for that trip. My data logger told me I used 6.1 kWh total for that trip and I added ~1.1 kWh to the pack from regeneration (I counted 22 regen bars on the drive and each regen bar is 50 Wh – page 39, Rav4 EV Quick Reference Guide). If that’s correct, then over 15% of the energy used for driving could come from regeneration. Even if we assume I normally get less energy from regen, say 5-10%, that’s still nearly as much energy as I get from DC charging. Two caveats: 1) this is one sample; 2) Your Regeneration Will Vary. Summary I. The EV market has improved a lot since 2012 when the Rav4 EVs started hitting the road again. There are many more EV options on the market now and most have greater range. 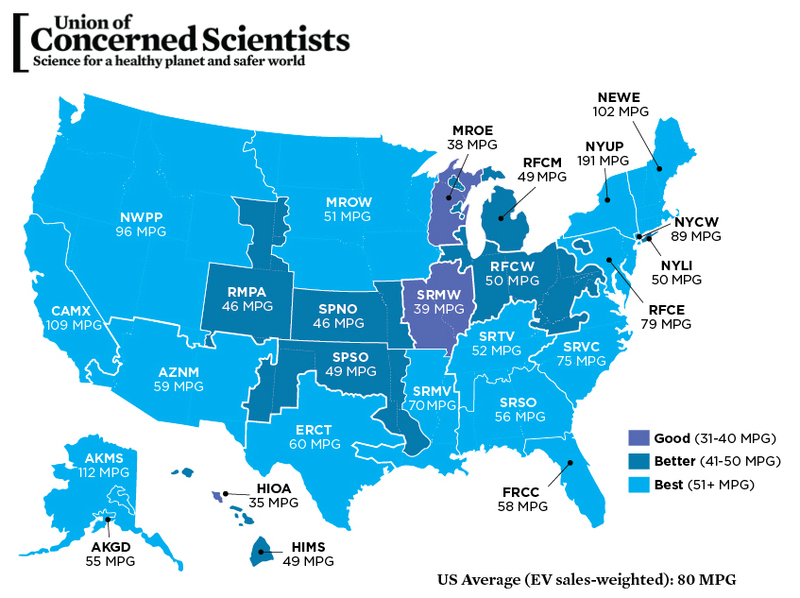 The Chevy Bolt EV is available, right now, with an EPA-rated range of 238 miles, the 2018 Leaf gets 150 miles and the 2019 Leaf promises more, the Tesla Long Range Model 3 currently hitting the road is rated at 310 miles, and other manufacturers claim to have more EVs under development. The future looks great but today the Rav4 EV continues serving our commuting needs. Factor in the 37 cubic feet of storage behind the rear seats and the Rav is a very useful car. 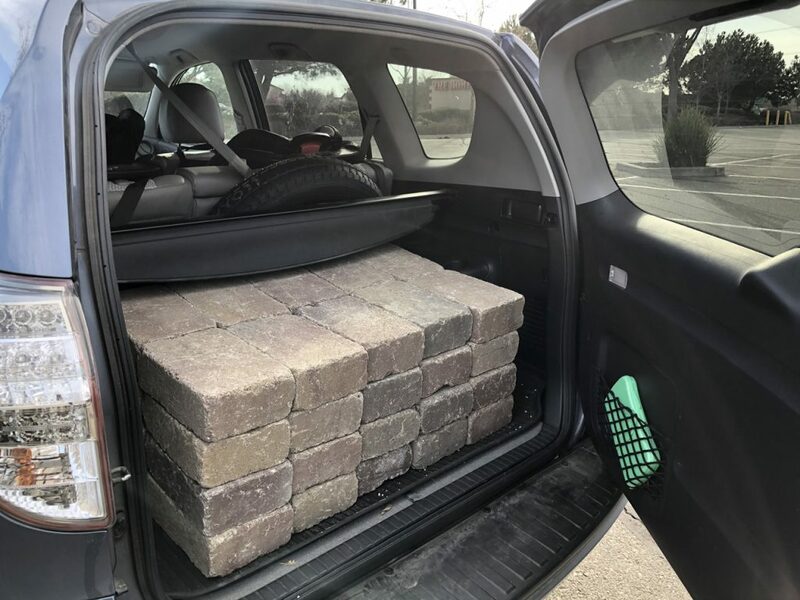 800 pounds of paving blocks? No problem, but don’t try this at home. The Rav4 EV will not drive you coast to coast, like a Tesla, or even to Las Vegas for that matter… not without serious dedication. But most of the time, 90% in my case, we’re just commuting back and forth to work and making local trips. For this purpose the Rav4 EV is a very good car. Add in DC charging and it’s great for regional trips too. Summary II. EVs reduce pollution today: Among the reasons to drive electric, two stand out for me: reducing pollution and using domestic energy. For those still wondering, no this doesn’t shift our source of power from gas to coal. EVs reduce pollution and CO2 emissions. In California, driving an EV charged from the grid is like driving a gas powered car that gets 109 MPG. Summary III. Used EVs are one way to test the waters: The EV market is still small – just over 1% of all cars sold in the U.S. in 2017 were plug-in electric cars. But the EV segment is quickly growing and there are many, many folks who will be entering the market for an EV. For those not ready to put down $30K or more for a new EV, used EVs could be a good way to test the waters. Some used EVs like the Leaf are very affordable, and used Rav4 EVs are being advertised in the 15k range depending on condition and mileage. I prefer all electric cars, but well-known options like the Chevy Volt are another way to go. Earlier model EVs are very useful for day to day driving, especially if you can extend the range with DC charging. There are literally hundreds of thousands of them out there. If you haven’t driven one yet find a friend who has and check it out, you’ll be surprised. And check out online forums for any particular EV to learn more, there are many knowledgeable owners with years and years of experience who can answer any questions you might have. My final point is obvious, for electric cars to really succeed the market needs EVs in all shapes and sizes. Somebody, and I’m looking at you Toyota, needs to market another electric SUV like the Rav4 EV. 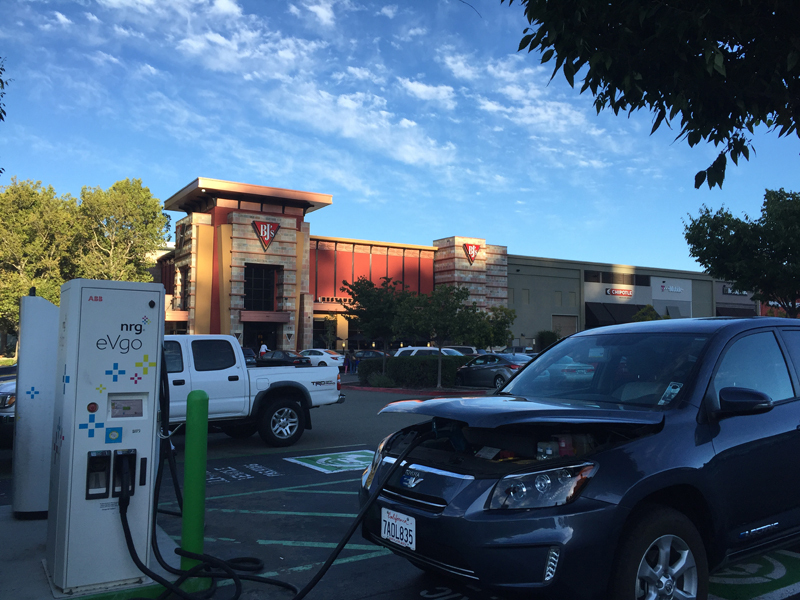 This entry was posted in Personal Posts and tagged CHAdeMO, DC charging, DCFC, Electric, electric cars, electric vehicle, emissions, EV, JdeMO, Lake Tahoe, Monterey, QCFC, Rav4 EV, Toyota, Yosemite on April 10, 2018 by Steve Noctor.